A little rain was not going to stop the 19th Annual Expect Miracles East Coast Classic from living up to its name as the industry event of the year! Golfers spirits remained high as they took part in this much anticipated charity golf outing raising funds for a cure. With unwavering support from the industry, led by Interactive Date Corp. as the Foundation Sponsor, this year's tournament welcomed over 250 golfers from close to 100 firms to Pinehills Golf Club on June 13th in Plymouth, MA. The event was a great day for the financial community to join together to raise funds for cancer research and patient care programs nationwide. 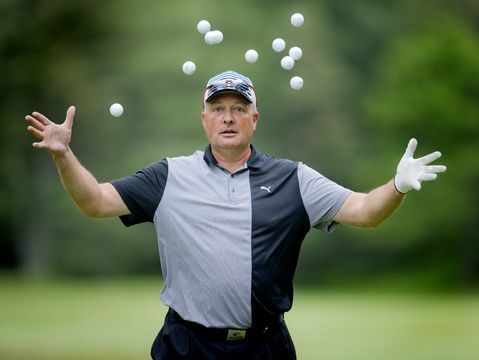 The morning started with an entertaining demonstration by trick shot master Dan Boever. Dan is a World Long Drive Champion ranking among the most popular performers on the golf exhibition circuit. After a memorable day on the links, the event was further highlighted into the evening by a dinner and awards ceremony, coupled with a live and silent auction featuring items like Taylor Swift concert tickets and a trip to the ESPY's . Jon Meterparel was the emcee for the night. Jon is a signature on-air personality in New England covering sports at both the professional and collegiate levels most notably with WEEI and as a BC football and basketball announcer. Jon introduced the evenings featured speaker, Emilyann Dearborn, who was the 2012 recipient of the Expect Miracles Foundation Scholarship. Emilyann was diagnosed with stage four Hodgkin's Lymphoma as a senior in high school. Emilyann engaged the audience as she recalled how difficult it is to have cancer as an adolescent and noted her appreciation of Expect Miracles Foundation's donors and sponsors. To learn how to support the community and the education of a youth impacted by cancer, click here. Founder & Chairman, Frank Strauss, announced the exciting news that the Foundation has been selected as one of the beneficiaries of the 24th Annual American Century Championship Tahoe Celebrity Golf Tournament in July 2013. We are grateful to American Century Investments for this opportunity. Frank concluded the event by presenting awards to two longstanding supporters of Expect Miracles Foundation. Lonnie Macdonald of UMB Fund Services received the |Expect Miracles Award| and Paul Tillotson of Fiduciary Trust Company received the |CJ Award| which was named in honor of Christopher M. Johnson. Building on the old or starting the new, the Foundation’s continued success is a reflection of loyal contributors. Sponsors have inspired Expect Miracles Foundation every step of the way. The Foundation's continued growth and success is a direct result of the growing interest the Foundation has received, building a national movement within the financial industry to lead the fight against cancer. Thanks to all of our sponsors, donors, participants, and volunteers for another great year of golf. See you next year!